PolyJet Matrix opens up virtually unlimited possibilities for closely replicating the look, feel and function of final products. It provides the technology foundation for industry leading 3D Printing systems that in a single build process can print 3D parts and models composed of multiple materials with various physical and mechanical properties. On top of that, PolyJet Matrix also tolerates on-demand customization of composite materials, called Digital Materials. This revolutionary 3D Printing technology brings an unparalleled level of efficiency and flexibility to 3D Printing. Objet’s revolutionary PolyJet Matrix technology works by jetting two separate Objet FullCure photopolymer 3D Printing materials in custom combinations. This dual-jet process combines materials in several ways. This allows the simultaneous use of two differing flexible materials, two rigid materials, one of each type, any combination with transparent material, or two jets of identical materials. Each material is transferred to a specific resin system attached to the PolyJet Matrix block (this contains 8 printing jets). Two synchronized print heads are designated for each material, which includes support material. PolyJet Matrix Technology controls each of the 96 nozzles in all the print heads. Preset mixtures of model materials are sprayed from nozzles according to model type and location. This provides full control of the structure of the jetted material and its mechanical properties. These “Digital Materials” provide specific values for Shore A values, HDT, elongation to break and tensile strength. Layer-by-layer, the materials are jetted in super-thin layers onto a build tray, until the part is completed. Each photopolymer layer is immediately cured by UV light right after it is printed. This produces fully cured models that can be handled and used immediately, without any need for post-curing. The gel-like support material is easily removed by hand and water jetting. 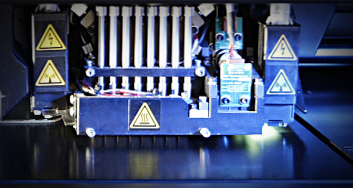 Dedicated Objet Studio for Connex™ software manages the 3D Printing process. It is able to handle multi-material STL files and can create files that combine different model characteristics, assemblies and materials.